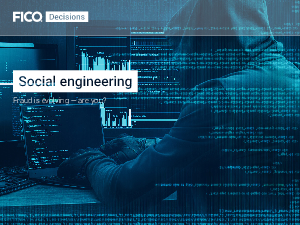 > FICO > Social Engineering - Fraud is evolving — are you? Scammers use sophisticated psychological manipulation techniques to build a level of trust with their victim, having them divulge confidential information or authenticate the fraudulent activity as genuine. They will typically claim to be from the bank or well known and trusted consumer brands.